The decision confirmed the death sentence imposed on 21 football fans for their participation in the riot last year when more than 70 people were killed. An Egyptian court confirmed the death sentence against 21 fans who participated in a deadly football melee in 2012. The main Judge of Cairo court Sobhy Abdel Maguid stated that 21 supporters were sentenced to “the death penalty by hanging”, while five more riot participants received life-long imprisonments. The stadium riot happened at the end of the game in Port Said between the local club Al-Masry and Cairo’s Al-Ahly side. Peaple were crushed when crowds attempted to escape from the stadium after a pitch invasion by Al-Masry fans who started throwing fireworks and stones at the visiting supporters sector. 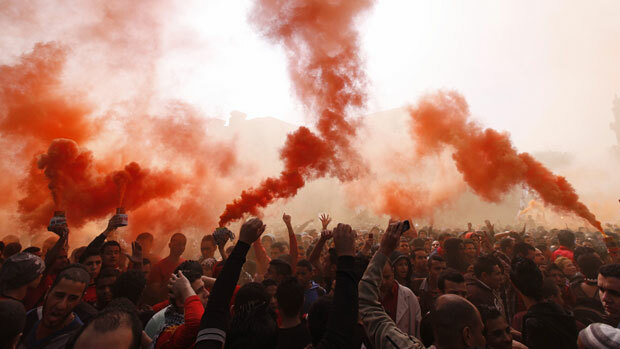 The court’s ruling sparked unrest at the streets of Port Said and Cairo where the crowd set fire to a police social club, the office of the Egyptian football federation and a fast food restaurant. The crowd demanded retribution to those who planned the killing. In Port Said, on the other hand, protestors were asking the change of the ruling and tried to blockade the Suez Canal by speedboats. Supporters and relatives of those sentenced attempted to storm the prison where the fans are held.